At Christmastime, it’s music which inspires the heart and stirs the soul for the season. Throughout the year, music activates memories and improves mood. In worship, it’s a vehicle of praise, adoration, and thanksgiving to the Lord Most High. But perhaps like no other genre of music, it is the heritage songs, in particular, that communicate the theology and core doctrines of the Church of God movement. These songs resonate warmly with the Christian experience, telling in joyful tones all Jesus is, what he has done, and what he promises to do. Powerful new songs may be heard more often today in most of our congregations, but the heritage songs have proved timeless through the years. That’s why Church of God Ministries is excited to announce the highly anticipated return of the beloved Heritage Sing to the Church of God Convention next June. New this year: the Heritage Sing will not pose a scheduling conflict with the General Assembly! 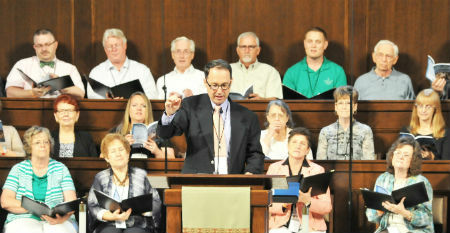 In recent years, the Heritage Sing took place at the same time as one of the General Assembly sessions as an alternative option for laypeople who were not a part of the G.A. But numerous pastors and lay delegates have expressed interest in also attending the hymn sing. We heard your feedback, and the 2:00 PM, Saturday, June 29, 2019, event is the only major event scheduled event at that time. Joe Gregory, senior pastor of First Church of God in Jefferson City, Missouri, is back at the helm of the Heritage Sing. In January, he’ll celebrate four years at First Church. But before God called him to the senior pastorate, Joe accumulated thirty-two years of music ministry it the Church of God, in Houston, Texas, and in Vincennes, Indiana. Even as he’s taken more to the pulpit these days, he cannot help but occasionally exercise his musical gifts. But it’s not just the music itself that he loves about the heritage songs of the Church of God. For Joe, the message of the songs is especially meaningful. 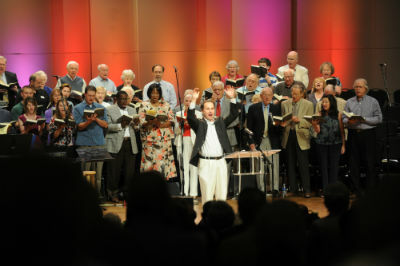 Joe Gregory leads the Heritage Sing in 2014. “‘There is Joy in the Lord’ is probably my favorite,” Joe explains. “I appreciate the message and the musical format through which the message is expressed.” About the song, Joe has further explained, “It expresses what I found to be true in my walk with God; to be true in experience.” One of Joe’s other favorite heritage songs is “We’ll Praise the Lord.” Though slightly less familiar across the Movement, this rousing anthem has beautiful moving harmony parts that also move the soul of this seasoned Church of God worship leader. Joe looks forward to the Heritage Sing coming up in June. He looks forward to recruiting several familiar faces and some new ones, as well, to help him lead the event. Most of all, Joe Gregory looks forward to lifting up the name of Jesus through some of the best music this side of heaven. Will you join him? Register for Church of God Convention 2019 and General Assembly, June 27–30 in Orlando, Florida, at www.chogconvention.org. There you’ll also discover speaker and artist information, as well as a schedule of events and activities. This entry was posted in All Church of God, Church of God Convention, Southeast and tagged CHOG Convention 2019, Convention 2019 and General Assembly, FL, Florida, G.A., GA, General Assembly, Give Life 2019, GiveLife2019, Heritage Hymns, Heritage Sing, Heritage Sing-Along, hymns, Joe Gregory, Joseph Gregory, music, music ministry, Orlando, praise, singing, songs, worship. Bookmark the permalink.